For those of us with carbon fibre bicycles or components, we are always worried about over tightening the bolts as this will damage the carbon fibre. An expensive mistake as I learned a few years back with a carbon seat post which was trashed when I misread the reading on my torque wrench. I recently received my new Silca torque took from a Kickstarter campaign that I supported so I thought it was a good time to do a comparison of a few tools. 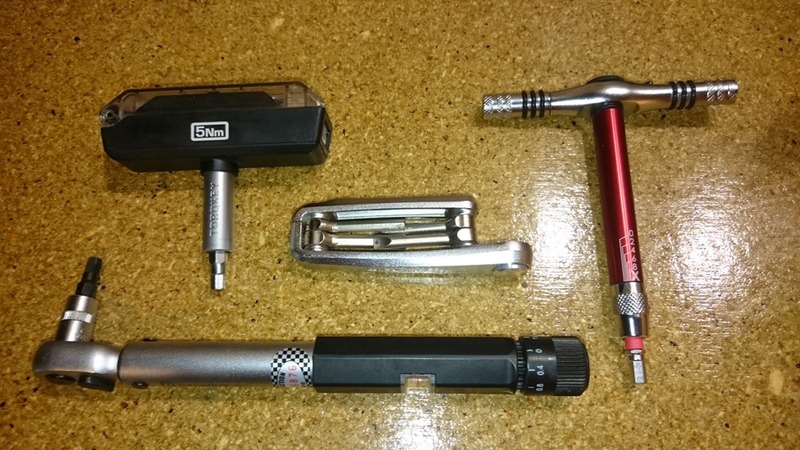 Clockwise from top left: Topeak Torque 5, Birzman M-Torque, Silca T-Ratchet and Ti-Torque, and then my ‘standard’ which is a precision dial adjustment torque wrench. In 2015 I did the 4,200 km Transcontinental Race from near Brussels to Istanbul. Since that wasn’t quite long enough I also did a warm up by riding 2,800 km from Istanbul to the start line. Great holiday, but there was one unintended consequence: by the time I got to Greece (6,000+ km) my hands had stopped working. When I had to pay for something I’d hold out the money in my palm and apologetically ask people to take the money. I recovered quickly after the race, but decided that I’d upgrade my bike to Di2 with electronic shifting. It was a great idea, but as anyone who is a reader of this blog knows, I’m never satisfied and I decided that I needed to modify the Di2 to put in shifting buttons both on my aero bars but also under the handlebars. This would give me three different options for shifting depending on where my hands were. This is a geeky post to show how it is done. Not only is it a lot less expensive than the $200+ for Shimano’s offering of bar end shifters, or $100 for a bulky ‘climbing’ shifter (parts cost me $40), but it’s a much tidier solution as well (especially compared to the climbing switch). “If you do well you should plan average about 12 km/h for the ride”. Marcus said just before we cycled to the Czech border with Germany to start line for the 1,240 km 2016 Grenzsteintrophy ride. He also told me that to date no woman had to date completed the Grenzsteintrophy (GST). This was going to be an adventure! Most people who do long-distance bicycle endurance racing are somewhat obsessive/compulsive about their gear. That’s putting it kindly. I’m definitely no exception and my blog is littered with posts on the most esoteric aspects of bike setup, equipment etc. Providing power to your gadgets (GPS, lights, phone, trackers, etc.) during races is an area we spend a lot of time on, and has provided endless hours of entertainment and frustration over the years. Since my first attempt at the Tour Divide in 2011, I’ve refined my approach—and there have also been sea changes in technologies—so I thought it was timely to put down my journey to hopefully assist others in finding the best solution for their needs, be it endurance racing or just touring. If all you want to do is to have power for your GPS or phone, don’t bother with dynamos etc. Get a couple of small 5000+ mAh power banks and use these. I’ve run my Garmin 1000 for almost 40 h on one of these—before it had to use the internal battery. The SON 28 is the best dynamo—but expensive. For mountain bike riding the Luxos is probably too fragile so better getting a K-Lite, Exposure, Supernova or similar. Get a Goal Zero recharger with Eneloop 2550 mAh AA batteries and which passes through while charging. You will be able to power your devices when the dynamo can’t and have 4 x AA batteries as well if you need them. Get the ZZing or Reecharge Powerpack which will convert the dynamo power to USB, and have integrated cache batteries. Alternatively, get the PedalPower Universal Cable and the Goal Zero recharger. The latter is best if you have extra devices which run on AA or AAA batteries. I’ve bought most of my gear from Peter White cycles in the USA. His site has excellent information on dynamos and a wide selection of gear. 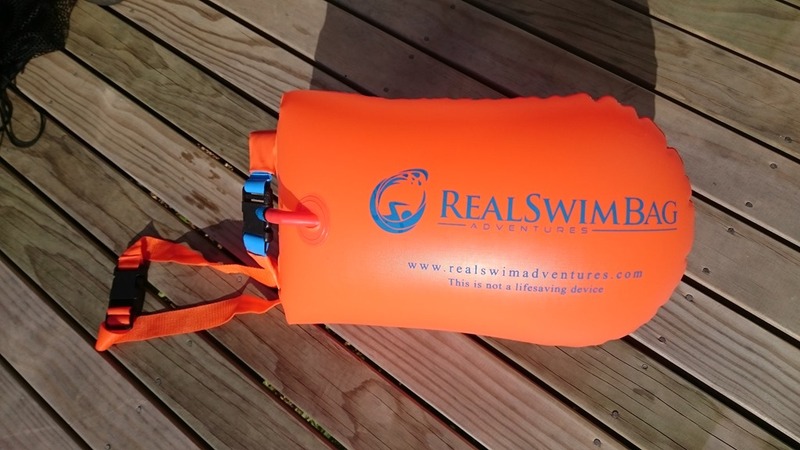 Enter the ‘Real Swim Bag’ which solves both problems. This is one of those inventions which is so obvious I don’t know why they aren’t common place. It is a dry bag which contains two bladders. You inflate the bladders and it floats like a buoy. There is a small belt that goes around your waist. It is completely unobtrusive and you don’t notice it when you are swimming. My wife Lis advised that it was very visible from the beach—especially as it was moving (slowly) across the water. The are only $NZ 50 (about US$35) from www.realswimadventures.com. I can’t recommend it highly enough. If you do any open water swimming get one. You won’t regret it.